The lively ferment in Etruscan studies, generated in part by recent archaeological discoveries and fostered by new trends in interpretation, has produced a wealth of information about the people historians traditionally considered as inaccessible. Now, scholars are reconstructing a portrait of the wealthy, sophisticated Etruscans whose territory once extended from the Po River to the Bay of Naples. non-specialist as an authoritative and readable guide to the burgeoning Etruscan scholarship. Phoenicians, Greeks, and other neighbors in the Mediterranean. Marie-Françoise Briguet, Friedhelm Prayon, David Tripp, and I survey Etruscan art, architecture, coinage, and daily lives, respectively, Emeline Richardson contributes what she calls a 'primer' in the Etruscan language, a basic archaeological introduction to the Etruscan language, meant to help newcomers read the inscriptions on many of the monuments illustrated and to see these with the interdisciplinary approach so characteristic of, and necessary in, Etruscan studies." The book is profusely illustrated with over 300 photos and maps. Notes and bibliographic references lead to standard texts on the Etruscans and to the more specialized literature in the field. 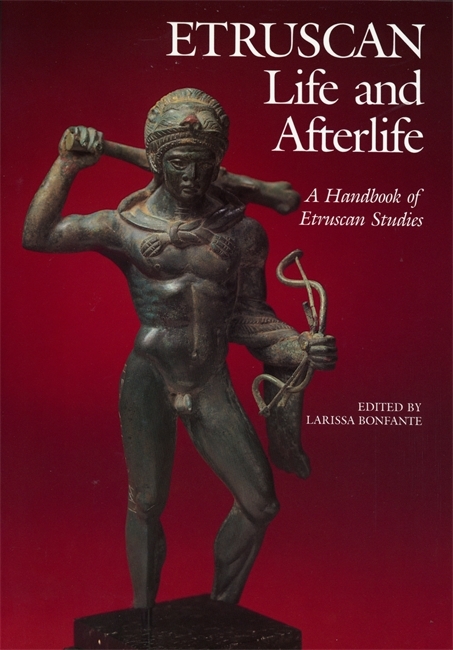 The result is a reliable and lively volume which brings readers into the mainstream of the latest Etruscan scholarship. Larissa Bonfante received the Ph.D. from Columbia University and is professor of classics at New York University. Having written extensively on the Etruscans, her books include Out of Etruria, The Etruscan Influence North and South, and with her father, the well-known linguist Giuliano Bonfante, The Etruscan Language.